Franklin D. Roosevelt was the 32nd President of the United States of America, the symbolic leader of the country. His presidency began in 1933 and ended in 1945. He was 51 years old when he first began his term of office on March 4, 1933. Franklin Delano Roosevelt was given his middle name after his great-uncle 'Franklin Hughes Delano'. Franklin D. Roosevelt was a distant cousin of Theodore Roosevelt the 26th US President. He had a variety of nicknames including F.D.R., The Boss and King Franklin. The nickname 'King Franklin' was a reference to his hosting role during British Royal Visit of 1939 when King George VI and Queen Elizabeth were the first reigning British Monarchs to set foot on American soil. The picture of Franklin Roosevelt portrays an interesting image of what this famous man looked like. The picture shows the clothing and the hairstyle that was fashionable during his presidency. He is described as an imposing figure, being 6 feet 2 inches in height and 188 pounds in weight. He had blue colored eyes and his wavy hair was brown that turned gray with age. He was short sighted and often wore glasses. A handsome man, he possessed great charm and was liked by men and women. He contracted polio in 1921, and found it difficult to walk without the aid of crutches, braces or a walking stick. He used a wheelchair, but this was kept secret from the public. Character and Personality Traits: What was Franklin Roosevelt like? The personality of Franklin Roosevelt is described as an extrovert, gregarious, persuasive and charming. He liked people and people liked FDR. He was extremely confident in his own abilities and was well able to cope with the pressure and stressful situations he encountered during his presidency. He was known for keeping his own counsel and was criticised by some as being devious. The important role and duties of the President of the United States of America include those of Chief of State, Chief Diplomat, Chief Executive, Commander in Chief, Legislative Leader and Leader of his own political party. What was Franklin Roosevelt famous for? Why was Franklin Roosevelt important? 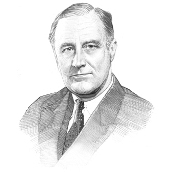 The history and life of President Franklin Roosevelt during his presidency is conveyed in the following fact file in an easy question and answer format. What President was Franklin Roosevelt? He was the 32nd President of the United States of America. The dates of his presidency began in 1933 and ended in 1945 (March 4, 1933 to April 12, 1945). What other political offices did Franklin Roosevelt hold before his presidency? What was Franklin Roosevelt' nickname? His most famous nickname was "FDR"
Who was Franklin Roosevelt' s first lady? Franklin Roosevelt was famous for the events and accomplishments of his presidency, but what are the facts about the man and his private life. Facts and information about the private life of Franklin Roosevelt can be found in the following fact file in an easy question and answer format. When and where was Franklin Roosevelt born? Where was Franklin Roosevelt educated and what was his religion? What did Franklin Roosevelt do before he became President of the United States? Who was Franklin Roosevelt' wife and when did they marry? Did they have kids? We hope that the picture, facts and information on President Franklin Roosevelt will prove helpful to kids, school children and schools learning about the presidency of this famous American leader. The facts about Franklin Roosevelt provides an overview of the President's character and personality traits. Watch the video and learn more about the major events of his life and his accomplishments. The following Franklin Roosevelt video is a useful educational resource for kids, children and schools learning about the life of the US President Franklin Roosevelt.